The photo of the 4 men and back of the photo are courtesy of Keith Lewis, Son of Sgt Donald R. Lewis, Crew Chief. Back of photo was written by Sgt Donald R. Lewis. 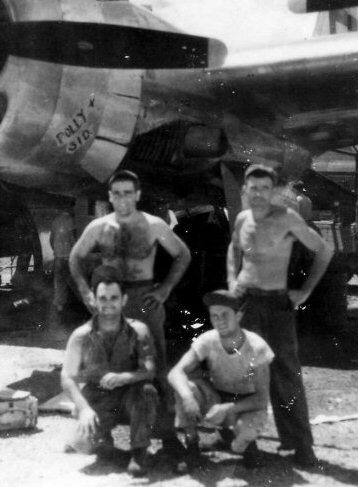 "Taken in front of number two engine of our ship - P-57. The bombs were being loaded for an incendiary raid on Tokyo. 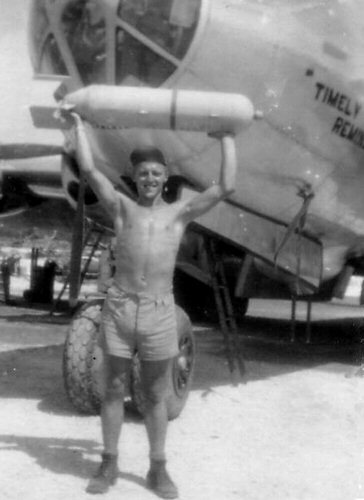 The box laying on the ground is filled with bursters which are inserted in the bombs. The engine you see in the picture belongs to Gopin. He has his and his wife's name on it. This was taken one Sunday while I was at church"
* Historian's Note regarding Paul Cwik: This is the first mention of Paul Cwik. To date (3 Sept 2012) there has been no prior entry in our database of his name. Our database is compiled from the various rosters and orders obtained from veterans and/or veteran's family members as well as mircofilmed records from 1945 (we are still going through the microfilmed records). "No record" in our database does NOT mean he was not in our group .. it may just be a matter of we have yet to obtain an order or roster with his name on it. 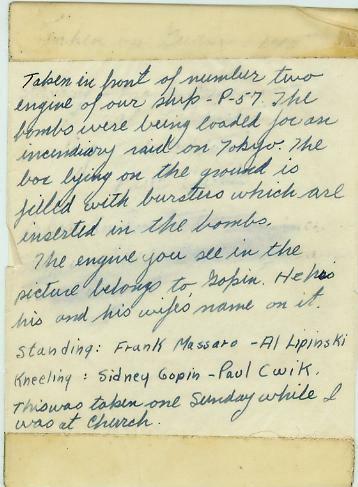 Many of the orders are dated Aug 1945 (rosters 9/45) it very well be a matter of he had already left the 39th BG by the time these rosters and orders were written.